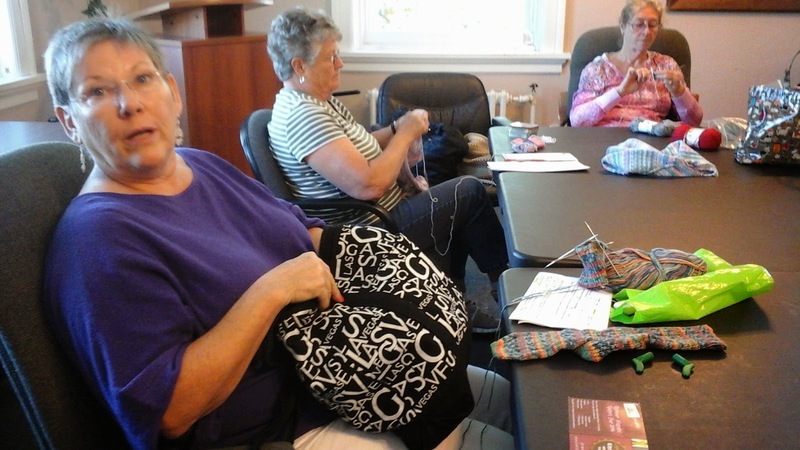 Back into the routine of Thursday Knit group and it feels great. Weather in Meaford this summer was apparently much the same as weather in Hearst - wetter and cooler than normal. Did that mean - less beach time and more knitting time? Or did that mean better gardening weather and so less knitting time. You can be the judge of that. Wee socks from Sharon and a 'don't know what it will be yet' piece from Ingrid knit with a very very fine Americo thick and thin cotton. 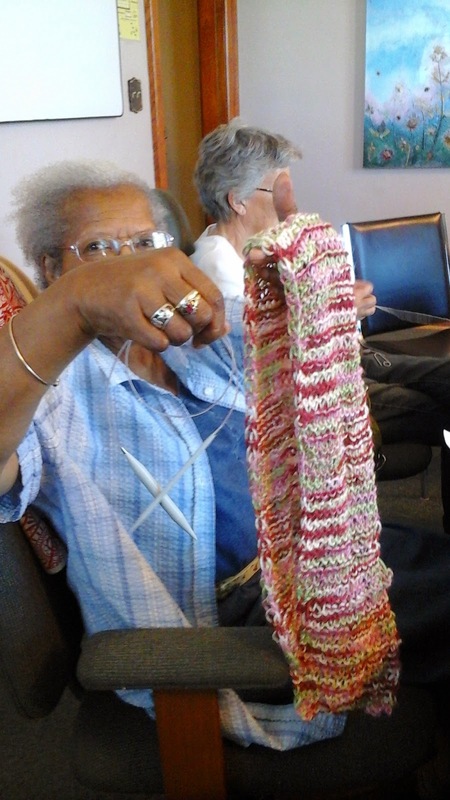 A sweater for a grandaughter from Gail and a'condo' scarf from Doreen. 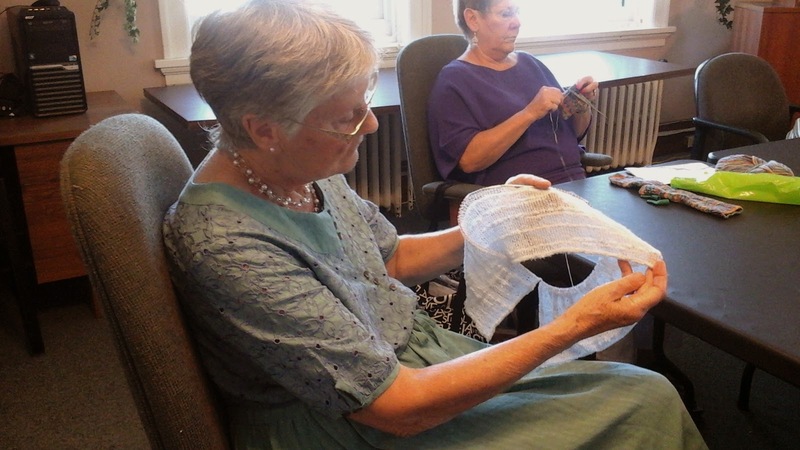 Knit with a circular needle that has one big gauge tip and one much finer. 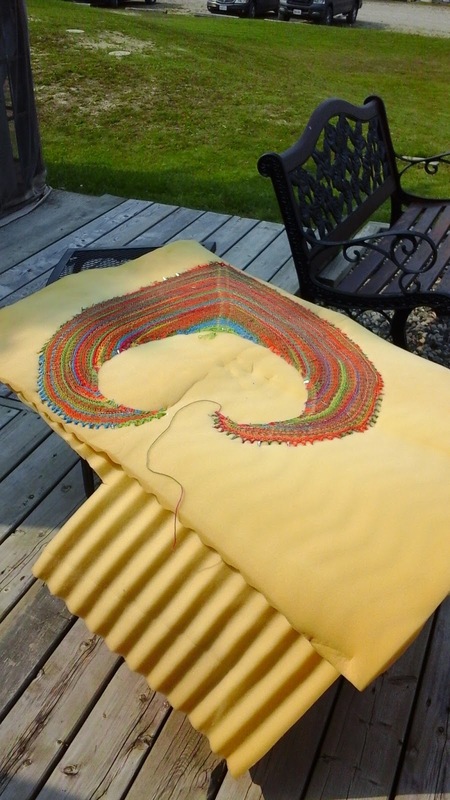 Produces an automatic drop stitch look with much less fuss. 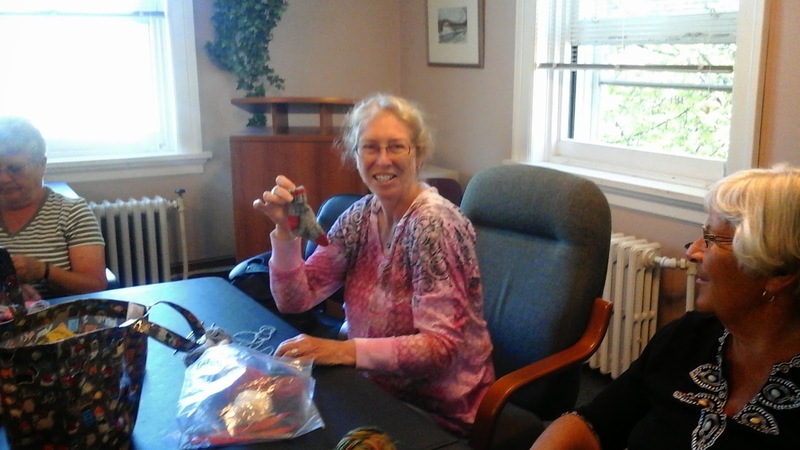 Doreen realized this summer - long after she purchased the condo needles - that she could have created her own 'condo' needles from one of her several sets of interchangeables. Oh well. I don't know about the beach or the gardening, but sure looks like lots of knitting to me. My summers, for many years, have all been the same. 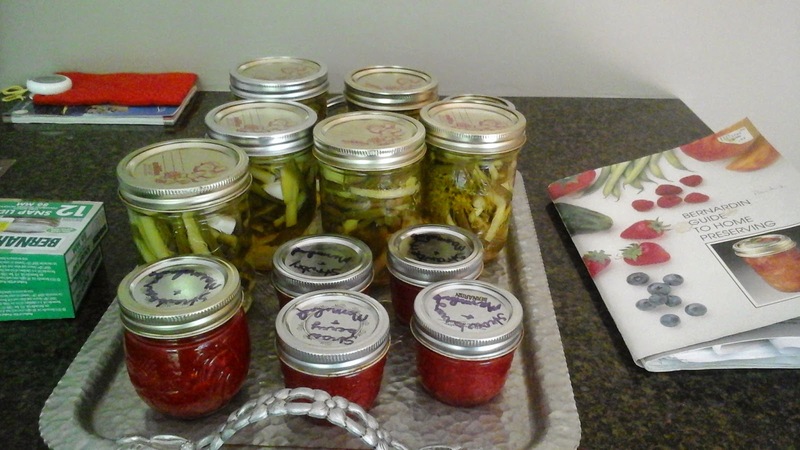 First I go to the trailer, then I come home and do some canning. This year is no different and so today started early with a trip to the market. Each Tuesday year round, both local and far-away vendors set out their produce in the Keady Market space. Many of the vendors are Mennonite. In addition to the great foods they produce, I, for one, enjoy a brief glimpse into their very different way of life. A friend and I go to Keady annually to get our canning supplies. We leave home at 6:30 - first come, first served - get our supplies then wander and gaze at the bounty. I am ready to begin my annual canning spree. Well re-begin as yesterday I did some dilled beans and some Strawberry Marmalade. You will notice in the top photo a new appliance. Thanks to Sandra of Curlerchick Blog, http://curlerchikparttwo.blogspot.ca/ who tipped me off to how helpful a food mill can be to the home canner. When I stopped at the store for jar lids they had very cleverly displayed the Food Mill right beside the lids. Too easy. Hopefully it will shave hours off my home made spaghetti sauce. Thanks Sandra. 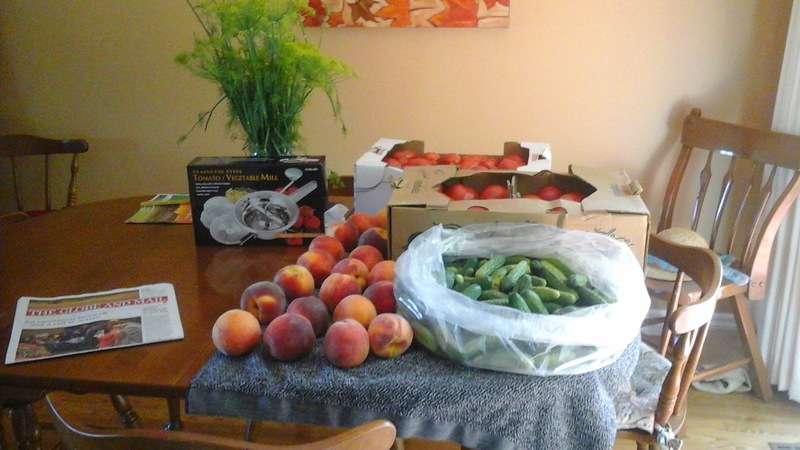 I hope to have a year's supply of Chili sauce, Spaghetti Sauce, Peach Pie Filling, Canned Peaches, 9 day Pickles, Dill Pickles and Salsa ready for the cold room shelves by the end of Labour Day Weekend. They don't call it that for nothing. We have a lovely back yard. Lot of trees and green grass. No other houses behind us. But as I sit on the deck this morning to write this post, I have to say, I am missing the trailer. There, the deck overlooks the lake making the trees and grass at home poor by comparison. This morning, though, I have a dental appointment - work on my $3000 tooth - so home I am. One of the things I do miss about home when at the trailer is the WiFi. There is none at the lake. Once home I spend hours on my computer, getting caught up from my summer of abstinence. Yesterday was a day with Ravelry. 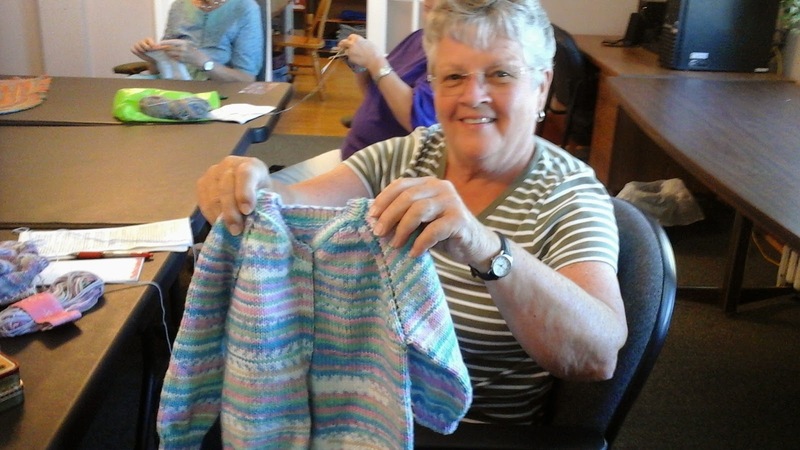 Is it just me or was there very little summer knitting? Fewer tank tops and little summer cardigans? 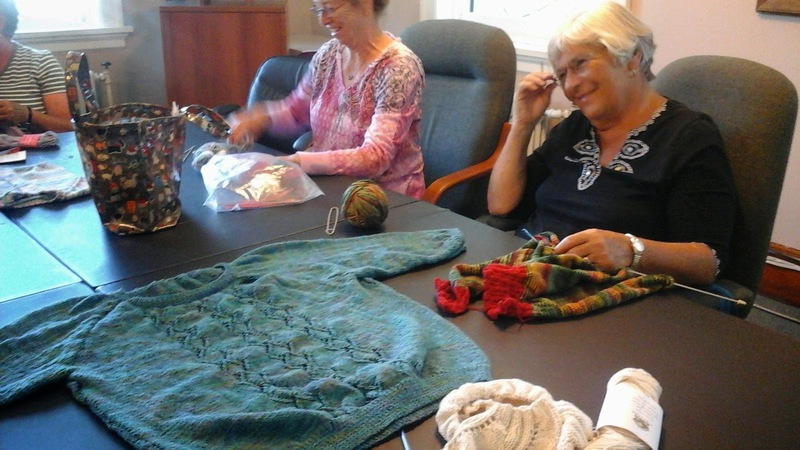 It seemed as if knitters carried on with hats, mittens, wraps and winter knits. My summer was cooler and wetter than normal with fewer summer knits. Perhaps it was the same for other ravelers. Trailer laundry and unpacking is done. Canning recipes are on the counter. The summer mail contained the flyer for the September KW Knitters Fair. All signs that the summer of 2014 is ending. Time to get back to routine and some serious knitting. 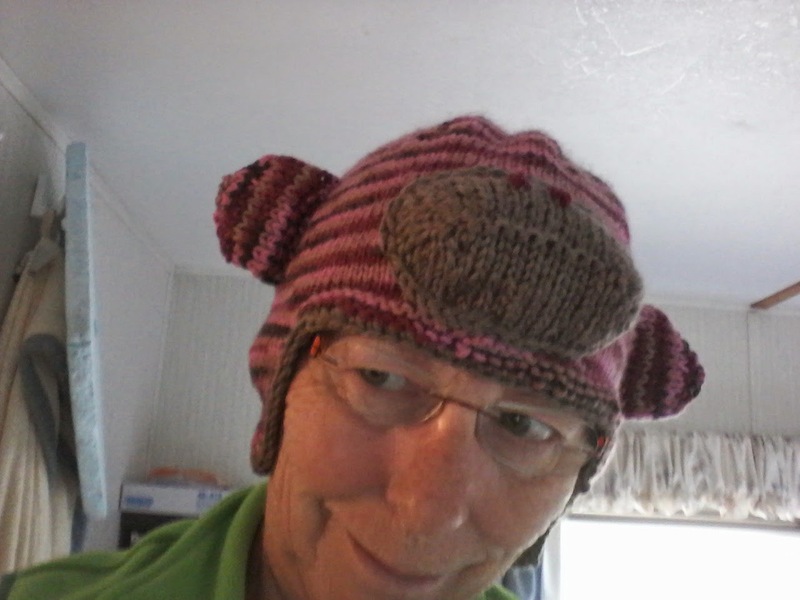 Appealing to a 12 year old it seemed, as Abi picked Canadiana in variegated pinks and a pattern for a monkey hat. With the model at a friend's house, Grandma got to try it on. Knitting News From The North. Despite July's 'stay inside - good for knitting weather - there seems to be a lack of trailer knitting production this year. 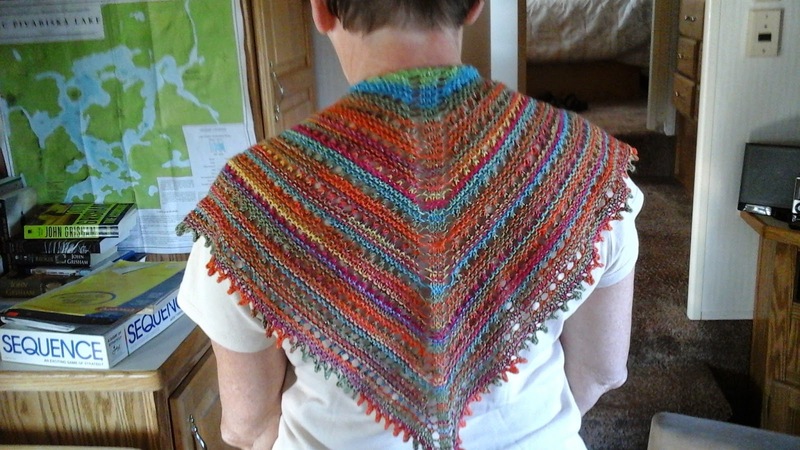 But this week, I did finish my little Talbot Trail Shawl. 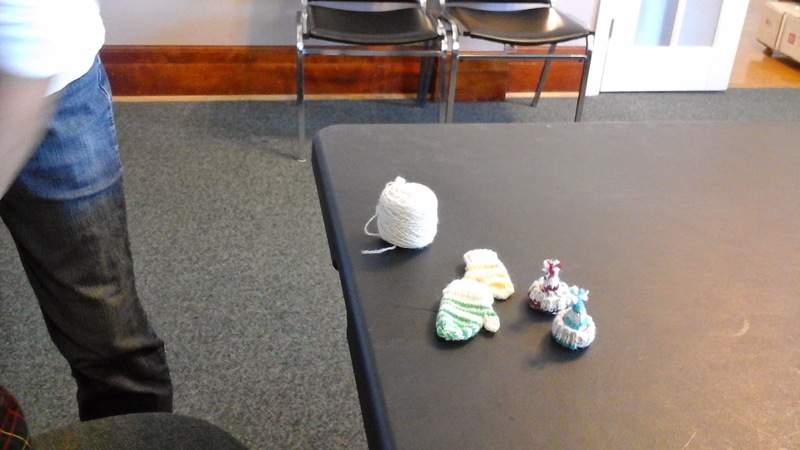 Both yarn and pattern were purchased last summer in St. Thomas at Little Red Mitten. Only a year on the shelf! Not the longest shelf life! 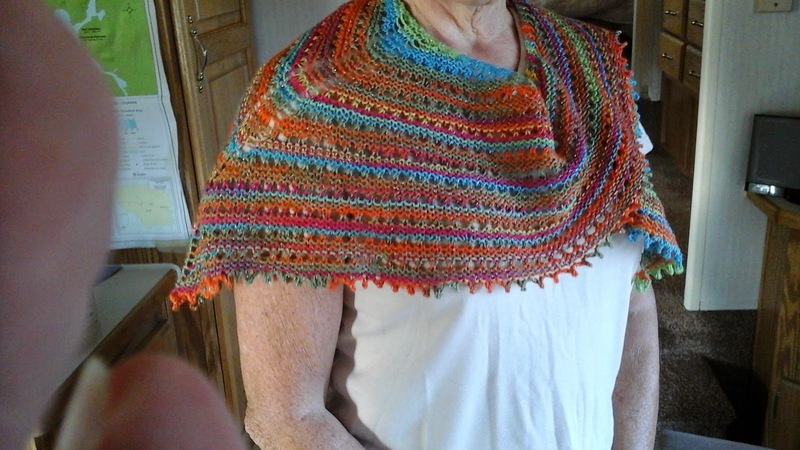 This pattern is one of a three shawl series designed by http://littleredmitten.ca/ Little Red Mitten's owner, Joan Janes. 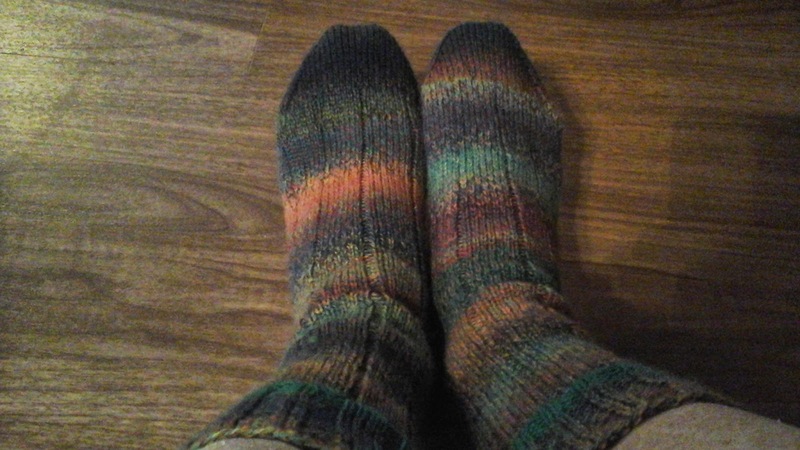 I chose Berroco's Mettalic Sox yarn for mine and it has produced a bright and cheerful piece. The shape is crescent shaped. Achieved by an outer edge increase on every row and a centre increase on every other row. This should brighten a dark winter coat or nicely accesorize a winter sweater. In fact I wear it as I write this -another cool summer's day. Happy summer everyone. 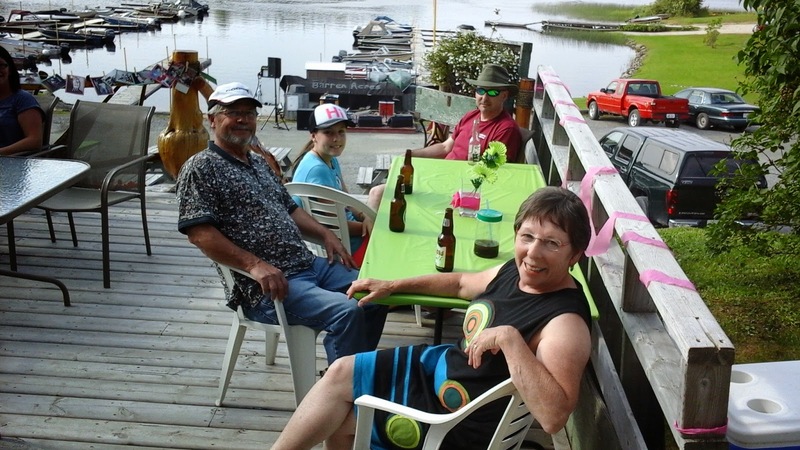 Saturday was party day at our marina trailer park. 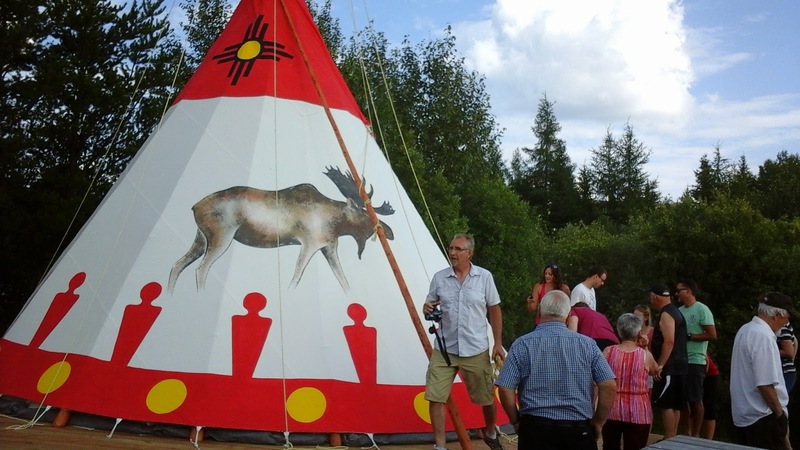 The reason for the festivities was the owner's 50th birthday. Or at least that is what the invitation said. But turns out, the birthday having occurred on June 6th, was just an excuse. - and rented out for the long weekend. There was live music courtesy of the owners' son and his band. Brenda and crew started the festivities at the bar. 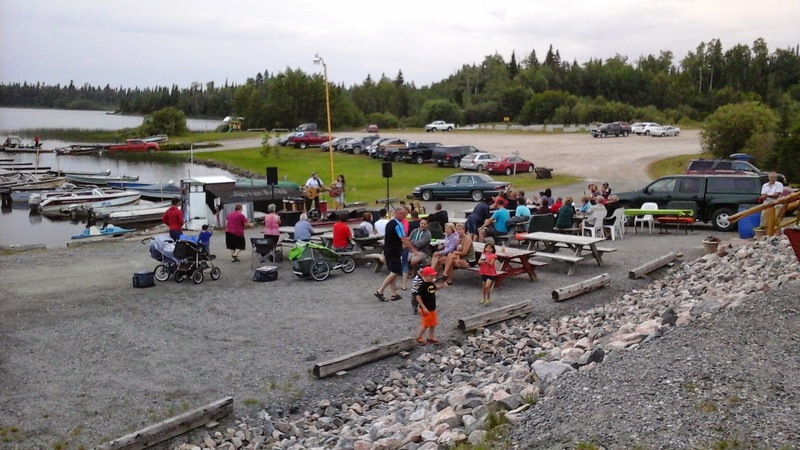 So very Canadian, to party by a lake. Move Nuggets From The North. Dismal would be a good word to describe the weather this last week. Daily highs of 14 or so with grey skies and days of drizzly rain. And what are rainy trailer days good for? Besides movies and card games with Grandkids? Knitting of course. Started from stash yarn then in hibernation for awhile as the stash ran out. Luckily, a good friend has similar taste in sock yarn and gave me a ball. Now complete, they are great socks. Kroy FX yarn and 2.50mm needles. 2 X2 ribbing that I morphed into a 7x1 pattern all down the leg and foot. I like them a lot. My colours of course. 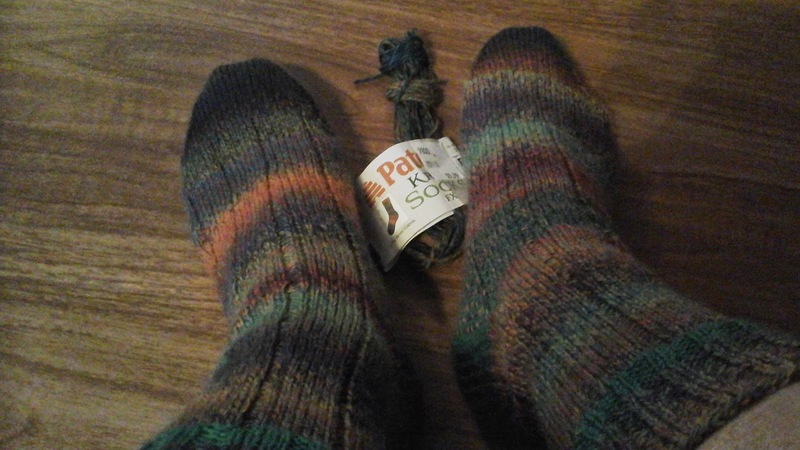 Having finished these socks, I'm into another sock yarn project. A scarfette. An easy simple knit I hope to have finished before my next Wifi day. In the meantime Happy Knitting All.